A versatile SUV like the Toyota 4Runner is capable of everything from off-roading to running errands on the weekend. But, which trim of this reliable SUV can offer you the most of what you’re looking for? 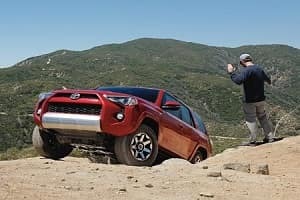 Andy Mohr Toyota put together this 2019 Toyota 4Runner trim levels review to help drivers in Avon, Indianapolis, and Plainfield decide. The Toyota 4Runner SR5 has standard rear-wheel drive, but 4-wheel drive (4WD) is available. It’s powered by a large 4L V6 engine that gets up to 270 horsepower and 278 lb-ft of torque. It’s equipped with Dual Independent Variable Valve Timing with intelligence (VVT-i) to make it more efficient. It features a 5-speed Electronically Controlled automatic Transmission with intelligence (ECT-i) and sequential shift mode for more precise gear shifts. Every trim level has the same standard engine and transmission. The exterior has heater power mirrors and color-keyed front and rear bumpers on top of 17-inch 6-spoke alloy wheels. Front and rear mud guards and skid plates are also standard on this versatile SUV. Inside there’s fabric-trimmed seats with a 40/20/40 split reclining and fold flat second-row seat and an 8-way power-adjustable driver’s seat with lumbar support to help you find your comfort setting. You get some refinement with your controls with a leather-trimmed steering wheel with audio and Bluetooth® hands-free phone and voice-command controls. This is linked to your Entune™ Audio Plus infotainment system, which also features SiriusXM® Satellite Radio and a USB port. The home for this system is a 6.1-inch high-resolution touchscreen on your dashboard. The next trim is the Toyota 4Runner SR5 Premium. It upgrades the seats to SofTex®-trim and uses technology to add some convenience features and upgrade the infotainment system. The power side mirrors now feature turn signal lights while there’s also a standard auto-dimming rearview mirror to help minimize glare from other cars at night. Your infotainment system now has Entune™ Premium Audio with Integrated Navigation and Entune® App Suite. The touchscreen features a split-screen display HD Radio™ Predictive Traffic and Doppler Weather overlay. The Toyota 4Runner TRD Off-Road is specifically designed to give you the freedom to take your SUV off-road and get through any terrain. It comes standard with Part-time 4WD with Active Traction Control A-Trac, plus you can adjust the drivetrain to your conditions with Multi-terrain Select and Crawl Control switches. To bolster it’s added capability, it features a distinct style with TRD Off-Road hard badges on the exterior, the TRD logo on the floor mats and shift knob, and silver accents on the front and rear bumpers. This stylish body now rests on bold 17-inch 7-spoke alloy wheels with black-painted accents. The next trim, the Toyota 4Runner TRD Off-Road Premium adds to that signature style with TRD red lettering on both the driver and front passenger headrests. It also gives you the convenience of easy access when you’re getting home with a HomeLink® universal transceiver. 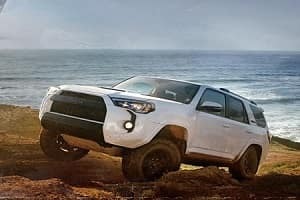 The Toyota 4Runner Limited returns the drivetrain to standard rear-wheel drive with Automatic Limited-Slip Differential but puts it on a more versatile X-REAS Sport Enhancement Suspension. It also has 20-inch 6-spoke alloy wheels to make its style match its added capability. There’s easier access to this trim with a Smart Key System with Push Button Start and remote illuminated entry. Once inside you’ll find perforated leather-trimmed heated and ventilated seats, a power moonroof, and sunshade. Your infotainment system gets some upgrades with front and rear parking assist sonar and the Entune™ Premium JBL® Audio with 15 JBL™ GreenEdge™ speakers. The Part-time 4WD with Active Traction Control A-Trac returns for the final and the most off-road ready trim, the Toyota 4Runner TRD Pro. It was built to get up and over any obstacle with TRD Bilstein® high-performance shocks and TRD-tuned front springs. It brings back the TRD stamped floor mats and shift knob inside, but puts its own spin on exterior styling with a series of black TRD external patches and a TRD-stamped aluminum front skid plate. Come visit us at Andy Mohr Toyota and test drive the Toyota 4Runner. Each one of the Toyota 4Runner trim levels offers drivers in the Avon, Indianapolis, and Plainfield areas a dependable and versatile ride.